Next up in our Team Spotlight series is Alex Egurnov, Senior Software Engineer from the Backend Team. 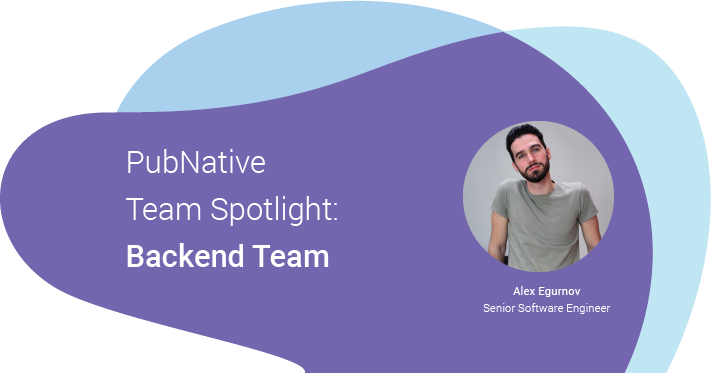 We got together with Alex to find out what he enjoys about working at PubNative, to learn more about the role of the Backend Team and what they’re currently working on. Who else makes up the Backend Team at PubNative and what are your main responsibilities? On my immediate team is Luis, Pavel, and Florian – all Software Engineers. Luis leads the team but everyone works on the same type of tasks. We are in charge of PubNative’s software, the most important of which is our ad server, but we also maintain all related services and occasionally manage infrastructure tasks. We dedicate a lot of attention to speed, stability and code quality, as well as optimizing resource usage and security. The Backend Team works closely with the Product, Data, Mobile & AdTag teams and there is a high level of visibility in everything we work on. What drew you to PubNative in the beginning? I used to work at IBM but decided to try something smaller, more agile, faster and, well, more fun! It’s been nine months now since I started at PubNative and it was the classical shift from enterprise to startup environment. What do you find most rewarding about your role at PubNative? I like that I get to do different tasks and learn new skills all across the board and I’ve learned a lot recently about Kubernetes, AWS, and a lot of operations work, which has been really beneficial to me. What are some of the different technologies that the Backend Team gets to work with? We work with many technologies such as Kubernetes, Docker, Redis, MySQL, Go, and more. The last one is a programming language which is relatively new in development. It’s still changing but is quite stable and is becoming more and more popular over the years. It’s great to work in a flexible startup environment as I get to play with new and exciting technologies and be among the first companies to adopt what later become industry best practices. I first moved from Russia to Mannheim and then to Stuttgart so I’m already more than five years in Germany. I wanted to move to Berlin to be in a bigger, busier city with a more diverse culture and social events. Also, I felt that Berlin had more opportunities for my personal and professional growth. What’s your favorite memory from PubNative so far? My best memory is the week I joined PubNative as the company was celebrating its fourth anniversary so my first Friday at work was a boat party 🙂 Fun first week! Thank you to Alex for giving us an insight into life at PubNative! Stay tuned for the next edition of our Team Spotlight series. While you’re here, check out our other posts and get in touch with us (marketing@pubnative.net).